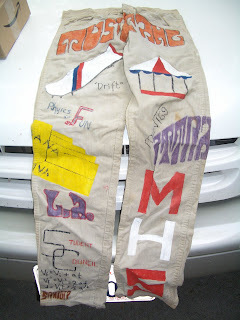 I have a pair of pants that are very similar except that they are from the late 80's. They are in a box in the shed so that I can pull them out when my daughter starts to think that she is the first person to rebel a bit. The silk--It might be that the serecin [sp?] 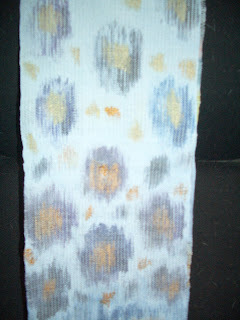 wasn't removed properly from the silk, or that it was dyed with a fugitive dye for some kind of color coding purpose. If your overdying isn't colorfast, you might want to try experimenting with scouring a sample to remove the serecin. Go to www.wormspit.com for a recipe--it involves washing soda if I remember correctly. I would also suggest trying citric acid--it strikes faster and harder than vinegar.